Hands up—how many of you went to RWA’s National Conference in Anaheim last week? I heard there were about 1,700 romance writers gathered there, and I had a brilliant time meeting as many of them as I possibly could. What an incredible atmosphere! It was only the second writing conference I’ve been to (the first being Nationals last year in New York), and this year I felt much better prepared and more confident. After four days of workshops, pitch sessions with agents and editors, and chatting with new friends, these are the biggest things I took away from the conference. 1. 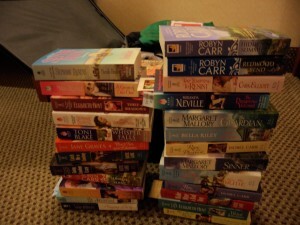 Craploads of free books! Last year I discovered several new-to-me authors, thanks to the free books given away at Nationals—including the very talented Jane Graves who was a double RITA finalist this year. As wonderful as these books, they’re not the most important thing I took home from the conference. So what else did I get?